At this time of year, all Greek churches have a festival, usually over a weekend, starting late Friday afternoon through Sunday evening. Each one of these festivals celebrates the rich Hellenic culture that is not only historic but a culture that celebrates life! A culture that has spread over much of the world in Greek communities that are united in a common heritage and common faith, Orthodox Christianity. To most of you who have enjoyed attending a festival, it means FOOD!! Souvlaki (shish-kebabs), gyro(pita bread piled high with spicy, grilled beef and topped with tomatoes, onions and tzatziki sauce), lamb dinners, spanakopita, Greek salad with warm pita bread, kalamata olives and feta, calamari, loukaniko (Greek sausage made with beef, pork and orange zest), and sometimes mousaka (eggplant and meat casserole) and pastitsio (pasta, cheese and ground meat). Let’s not forget (oh, I didn’t) the delicious Greek pastry. The most well-known is baklava (filo pastry layered with nuts and butter, sweetened with a honey syrup), but go “beyond baklava” and try galactobouriko (filo pastry filled with a creamy custard and laced with honey), kourambiedes (butter cookies drenched in powdered sugar that melt in your mouth), melomakarona or feenikia (cake-like cookies soaked in honey) or karidopita (a walnut cake made moist by pouring honey over it). Did you notice that honey is the ‘star’ of all these incredible pastries? The main attraction is often the loukoumathes booth. These are light and airy donut holes drizzled with honey while still warm and topped with crushed walnuts and cinnamon. These are so popular, the line is always very long, but take heart, these are made fresh and each order has a pile of these little delectable balls on every plate. Keep in mind that all this food, pastries included, is authentic and made by the church members who have worked very hard to bring you this experience. While walking around the festival grounds enjoying the tantalizing aromas and sampling different foods, you will hear the haunting sounds of the bouzouki calling you to the dance floor. Follow that sound and join the line of dancers. You don’t have to know how to do it, just follow along and have fun. Feel a little Greek as you whirl around the dance floor and yell, ” Opa! 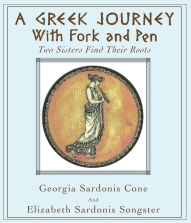 !” If you have never attended a Greek Festival but know of one nearby, don’t miss it this time. A wonderful experience awaits you. Yassou! And see you next time. 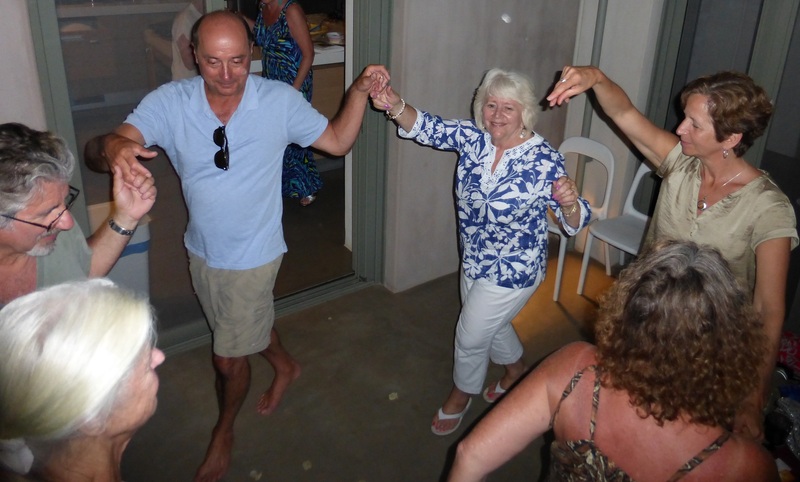 Photo by Dan Songster of some of our cousins dancing at our villa in Greece for one glorious, unforgettable week compliments of our cousin Michael Giftos!! Tagged as: bouzouki, Greek dancing, Greek Festival, Greek food, Greek music, Opa! These sound so scrumptious. My mhoter makes Baklava from scratch (she is much more ambitious than I.) I still haven’t ever used Filo dough. I fear I will be saying that for another 10 years until finally I do, and realize it’s not nearly as scary as it seems. Oh, no! It is not as scary as you think! It is very forgiving. If it tears while working with it, you just patch it up. Once it is cooked no one can tell a thing! Try it…you will be glad you did! These sound wonderful. My family used to prepare our delicious Greek food. I’m afraid now, I’m old and disabled and unable to cook anymore. But, the photos bring all the great memories of our food back. Thank goodness for the church’s food festival so I can enjoy the desserts again.